Sorry to rant this morning ….. I am so frustrated I feel like exploding this morning. Having backed my documents, pictures and videos successfully (I hope) my computer was restored to factory settings last night and is worse than ever now, I didn’t finish working on it until 12.15am and have been back stuck in front of it since early this morning too. As you know I am very untidy, now I have to try and plough through all my papers to find the receipt for my Office suite and the computer itself, not holding my breath because I got it just over a year ago and don’t think that I am going to get anywhere with the vendors anyway. Sorry about the rant but I am just SO FRUSTRATED!!!!! Hopefully some felting will calm me down and Alan has promised to lend me his personal laptop tonight, fingers crossed nothing happens that one when I borrow it. 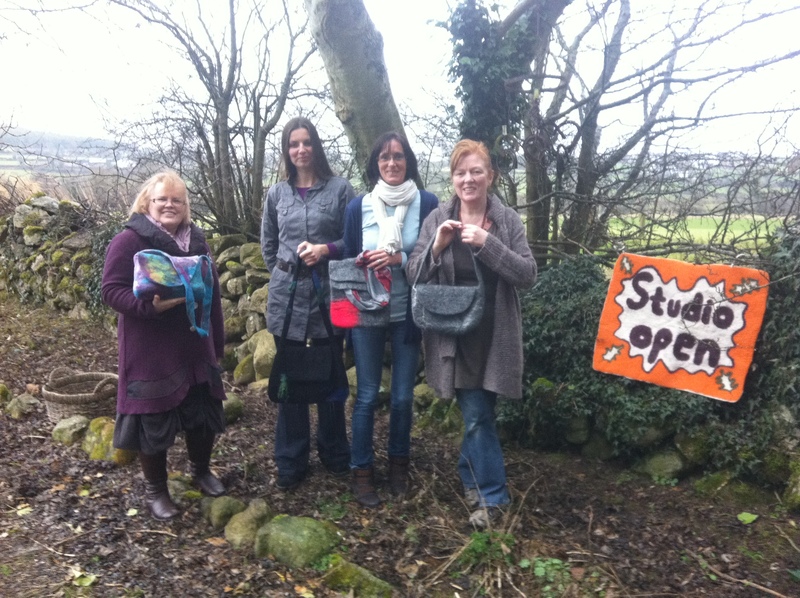 Felting update tomorrow all going well ……………. Today has been an excellent day for seeing several of the book projects through from start to finish. Firstly I tackled a highly textured nuno felt scarf, then a 50% silk 50% merino scarf/neckpiece (need to think of a new name for this! ), next I felted a really striking but simple raw silk and merino lampshade and finally by combining the waste left over from this project with some raffia and a spare Bodum coffee container I made the easiest felt candle holder imagineable! Now I am just going to spend a few minutes looking up something on the computer (no, it is not fixed yet, more work remotely tonight hopefully) and then back to get on with my next item. I think it must be the fact that we put our clocks forward one hour last Sunday because I am really motoring along with the felting these last few days although unfortunately I need to do some paperwork urgently, ugh. I also need to sort out a materials lists for my US workshops (do you know how EXCITED I am getting about these?????) and I also need to update everyone about Horst’s workshop here as well! No electricity here tomorrow for the whole day so guess it’s felting again for me!!! 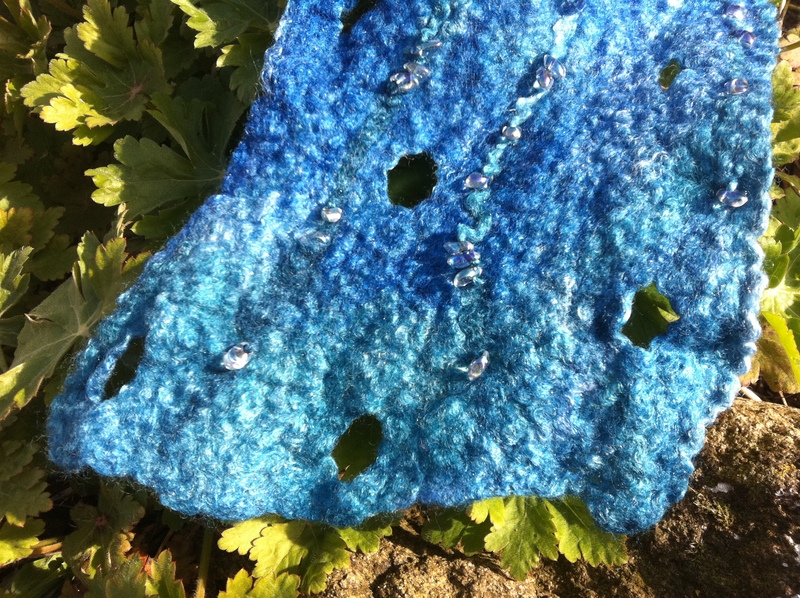 Glass beads glisten against the shimmering silk and merino felt ……. I hadn’t intended posting any photos of new work that will be going in the book but couldn’t resist this shot demonstrating how the glass beads glisten against the felt in this silk/merino scarf! It is pretty bright lightwise this morning so maybe the colours are slightly bleached but you can really see how the high percentage of silk in this fibre combination (50% silk 50% merino) shines when felted and how it also lends a great sense of movement to the piece. As many of you know already I have been having HUGE computer problems that still are not sorted two weeks after I started to seriously try and address the issue. My techy guru posted me an external drive last week when he was having difficulty transferring things remotely and would you believe it my flies are just refusing to transfer over to this new drive for me too, URGH, a lot of work to do today so no felting I fear! The up side of things will be that once I get all the problems ironed out Chrissie and I will be finally able to share our files online, see the layout of the book, edit and adjust things to our heart’s content, in short, do all the necessary to put the thing to bed, bliss! Thanks for all your positive messages and comments about this upcoming publication, I hope you won’t all be disappointed!!! I am also going to be uploading a HUGE amount of photos to Flickr during the day, this will mean that I don’t have to store them anywhere else, at least that’s the idea, hoping it will work. Some of these photos may be old work I never blogged about before and some of them may be new or unseen, not sure yet exactly what files I still have lurking on the computer! A little about our new book and just a glimpse of some raw materials from yesterday! Working on our new book has really forced me to write down ideas as they come into my head and document projects on paper more than I would otherwise tend to do, for me a lot of my documentation is through this blog but sketching more is really helping me clarify ideas and leading me to explore them in a more systametic way than I have being doing previously. Chrissie is brilliant at this anyway and I really look forward to seeing some of her sketches and musings when she comes to stay with me in April for our final efforts to put the book to bed and get it available online. I don’t want anyone to get the idea our book is going to be the bee all and end all of felting techniques, it’s not! Rather it is an idea of how we both work as well as a demonstration of how we translate our thoughts and ideas from the inspiration stage into the finished felt item. I love gathering up my raw materials at the start of any project, the possibilities seem endless at this stage when all the beautiful fibres and colours are gathered together just waiting to be selected. Sometimes however, I find that having a wide selection of different fibres to work with can bring on its own worries and often just getting started is challenge enough for one days work alone! Yesterday was one of the good days. 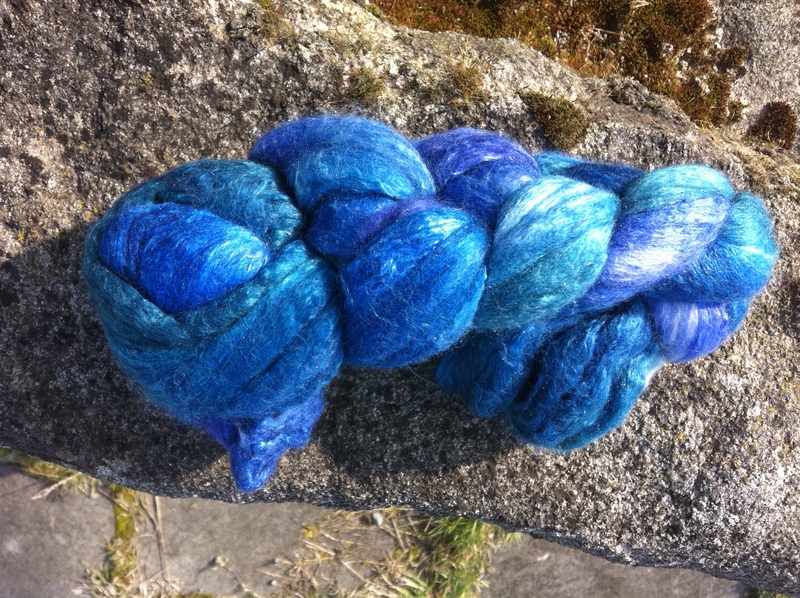 In the morning I selected some stunning 50/50 hand dyed silk/merino roving which I bought at the Rhinebeck Sheep and Wool Festival from the wonderful Joan Berner of Cloverleaf Farms, one of my all time favourite suppliers now!!! I wanted to use it for a very special project and demonstrate how a small amount of luxurious fibre could create the most beautiful scarf imaginable! Although I am not showing you a photo of the finished article imagine the glistening sheen of clear glass beads against the wonderful and subtle variations of colour in this blue based combination which Joan has called Sapphire. I based the scarf’s design and colours on the beautiful blues and greens in the clear waters off La Gomera in the Canaries and Kos in Greece. Wearing this piece (if I keep it for myself!) will bring back happy memories of holidays shared with Alan, the glass beads are NOT sewn in after the scarf is felted, wait for the book to see how I include them in the lay out stage!! !The second piece I felted yesterday is waiting on my table now to be transformed into a sleeveless vest/wrap type of affair, probably NO sewing again but maybe a couple of judicious stitches around the collar region, I’ll have to wait and see how it drapes once I cut out the armholes and put it on my manequin. Again I loved gathering the supplies for this one, originally I had a big pile of silk fibre and hankies, beautiful Blue Faced Leiscester, linen fibres (all of these hand dyed) and some different colours of silk chiffon fabric. 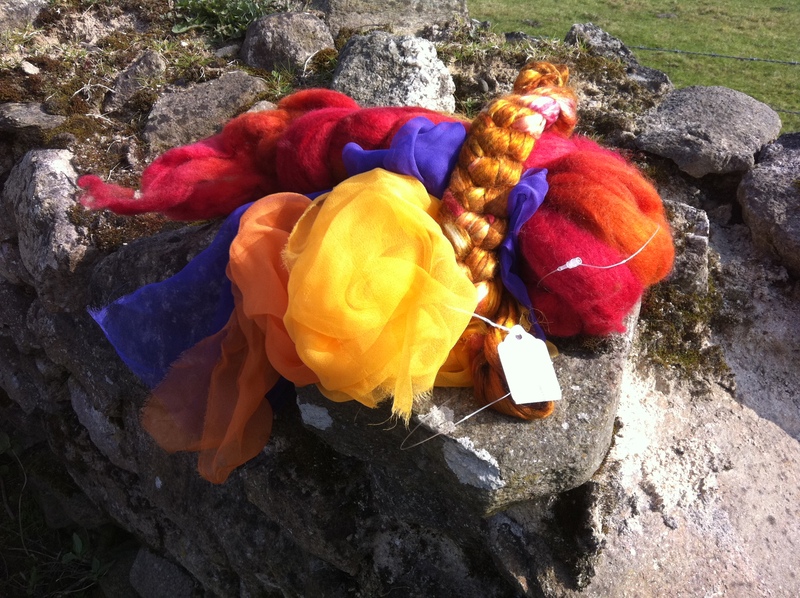 In the end I felted this piece using ‘Chili Pepper’ BFL roving from Joan, silk hankies, silk fibre (again from Joan! ), two colours of silk chiffon and then added a fine layer of orange merino because I wasn’t sure that I had enough BFL to make the vest strong enough. Chrissie is really the master at the nuno felted jacket, I did however want to include a wearable piece requiring minimal stitching in the book, I know I could have done a bigger seamless project but really that’s not what I do every day, this type of felting is much more suited to my organic kind of style! Anyway, here is a glimpse of some of the raw materials before I made my final selection. Technically this wasn’t a nuno piece having more fibre than fabric, today I hope to felt a highly textured nuno wrap, one of my all time favourite projects! Thanks to Andrea who left me a message on Facebook suggesting that I try dying my unsuccessful white on white little felt bag. I really do need to study the dying process properly but I find that there’s only so much time in one day and far too many things I need to do with that time usually!!! I’m going to spend some time experimenting with Horst this June, he is really a master dyer and I am so looking forward to his workshop (a couple of places still available if anyone is interested!) and watching the magic as large white felt garments become wonderfully colourful creations under his excellent guidance and steady hand! I couldn’t cope with all the accurate measuring, preparing, heating and clean up involved with using acid dyes the other night, instead I have to confess I was looking for pretty much instant gratification! Sharon and I had stocked up on Rite, Neon and Kool-Aid while I was in Loomis so I just decided to give things a whirl in the microwave with a big dollop of green Neon food colouring. Neon pretty much describes the resultant colour perfectly! 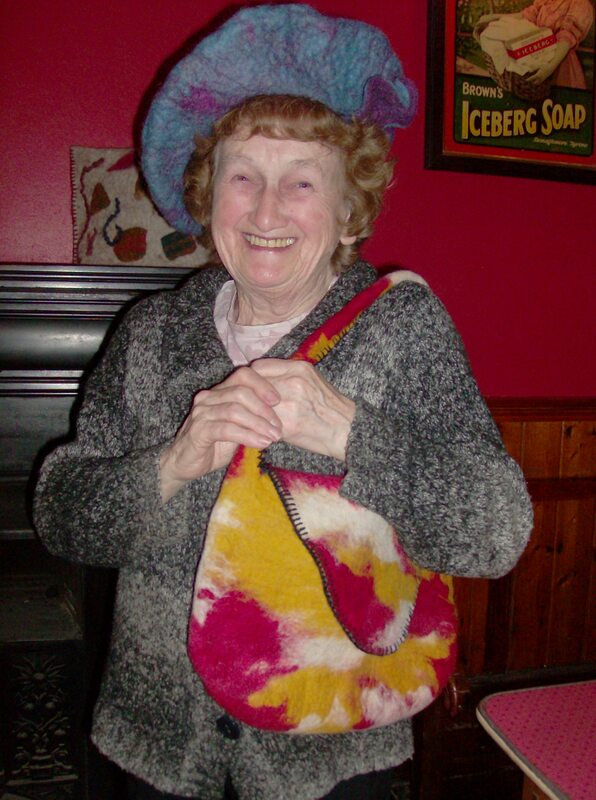 The bag was still wet from the felting process so basically I added some vinegar and about 20 drops of food colouring to a small quantity of boiling water, dunked the bag into the liquid, swirled it around for about 5 seconds and then lifted the top portion of the bag out of the dye. I then placed the bag and left over dye in a sealable microwave bag (it’s a small bag remember) and propped them up inside a cooking bowl. My microwave is not very strong so I gave it 5 minutes on high and then a break of about 2 minutes, 5 more minutes on high, another break and then a final 4 or 5 minutes on high again. All the dye was absorbed by the felt so at this stage I called it quits and rinsed under running water, no running of the dye at all! My idea was to have a stronger colour green at the base of the bag and graduating shades towards the top edge, it worked! 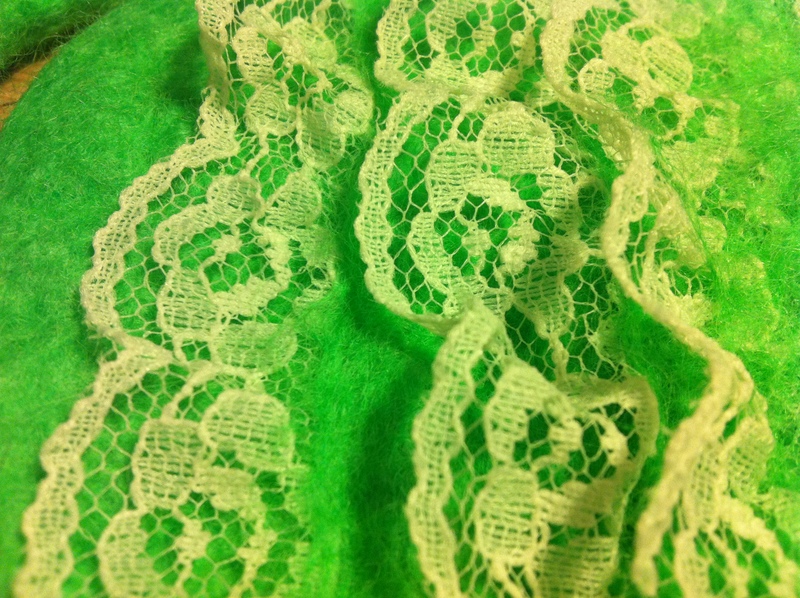 Note in the picture how the lace ruffles don’t take the dye, interesting how natural and artificial fibres react differently. Sorry I am not posting a picture of the completed bag, the design is actually a really simple first resist project if you leave out the ruffles and as such will be one of my projects in the book Chrissie and I are finishing! At the rate we are currently working I am pretty confident we will hit our deadline, more about this and a little idea of the concept behind the book and what you may actually expect to be blogged about in my next post. 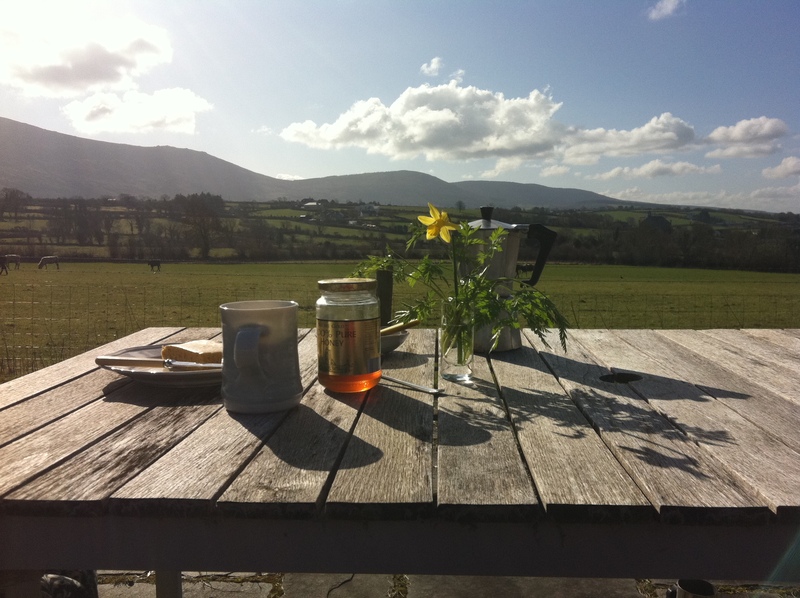 Lastly today, I was amazed to discover HEAT in the sun this morning so seized the opportunity to bring out my freshly baked cornbread and coffee to take advantage of the weather and eat breakfast outside! I know some of you are interested in Heather’s receipe so thanks Heather, here is the link!! !